REST -Repair, Eat, Sleep, Time -It is part of the program and so often overlooked. Especially by those of us who can be pretty extreme and try to fit 3483984 things into our day. Did you know that exercise can have the same affect on the brain as heroine? It’s addicting. The more we do it, the more we crave it. We imagine the rush of energy we’ll experience once we start working out and then that gets us wanting to move. You NEED a rest day. Even professional athletes take a rest days. It’s required for the mind and the body. We often push our bodies beyond they’re levels and continue to push without even realizing it. Sometimes we just need to chill. We don’t get results from our workouts during our workouts. The workout itself simply stimulates muscle growth, when you do hard weight training you are breaking down muscle tissue. It’s only when you give your body time to rest and recover in between workouts when actual muscle growth takes place. That’s the point of a rest day, to make sure you’ve given your body the time to show off your hard work. A good structured workout program will have rest days planned out in advance. Taking rest days will allow for better recovery of your muscles and central nervous system. This will give your body time to fully rest, recover, and grow between workouts. Then on the days when you do workout; you’ll feel stronger, have more energy, and be able to train harder in the gym. A common mistake of people new to exercising – and really even among experienced exercisers – is to workout too hard, too often. This might not seem like a big problem initially, but over-training can effect your health and is something that needs to be taken seriously. When you complete a full body workout routine, or do lots of compound movements like squats, push-ups, overhead presses or deadlifts, our muscles get broken down. Then, over the next 24-72 hours hours, those muscles get rebuilt a tiny bit stronger. That’s why it doesn’t benefit us to work out the same muscles every day; We don’t want to destroy our muscles without giving them a chance to grow back stronger. In a nutshell, this is a good rule; if a muscle group is still sore from a previous workout, do not train it intensely again until it has healed and is no longer sore. For example, if your thighs are sore from a lower body strength workout you did yesterday, you should not train them again today – or the next, wait at least 72 hrs to train that specific muscle group again. It doesn’t mean you have to take a complete rest day; you could train your upper body or core, or stick to light cardio, yoga, stretching, etc. Balancing your workouts to target different muscle groups on different days of the week allows you to take fewer rest days, but even then, you should save at least 1-3 days a week for rest, or at least active rest or active recovery. You don’t have to spend your whole “rest day” on the couch (you can, that’s fine too!). Light physical activity on a rest day can help boost your mood, your health, and your progress or ability to maintain your weight or fitness level. 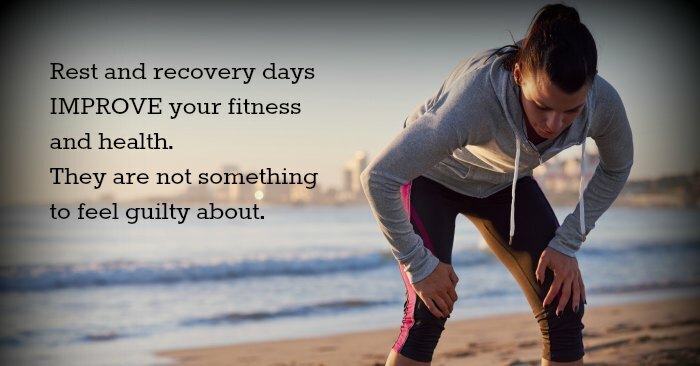 If you’re looking to stay active even on your rest days, good rule is that the activity should not be something that would cause you sore muscles. It should be at a reduced intensity from your normal workouts – meaning that even an active rest day is on somewhat of a sliding scale relative to your own fitness levels. One of the best things you can do on an off day is to work on your flexibility and mobility. After all, what good is strength if we can’t move our body properly to utilize it! Dynamic stretching and mobility work helps prepare our body for the rigors of strength training and keeps us injury free! This is a great question but one that doesn’t have a one word answer….It depends. It depends on your fitness level, if you’re training for anything and your job. If you’re new to exercise, it’s likely you’ll need 2-3 days of complete rest. 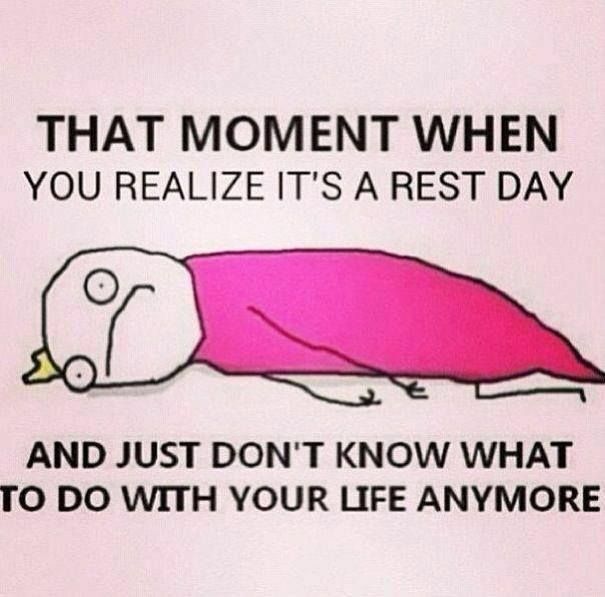 For most people 2 days is acceptable and for very few of us, we can succeed with a single rest day. Massage is an effective method of exercise recovery. Schedule a professional massage on your off day to help remove toxins in your muscles, break up scar tissue and lengthen your muscles. It promotes blood flow, supplies nutrients to your muscle tissues and increase flexibility. To lift right after your massage, you are not giving your body proper time to heal and hydrate with water; to rid all of the lactic acid and inflammation from your body. You will just build on top of what you already had prior to your session. It is recommended to take 24 hrs off of your exercise routine after a massage treatment.